One Astor Plaza, located at 1515 Broadway, is an icon in New York’s Times Square. As the headquarters of Viacom, tens of millions of people visit the building every year, and television viewers around the world recognize it as the location of MTV’s broadcast studios. In addition, the building is home to the Minskoff Theater, which hosts the Broadway production of The Lion King. For owner SL Green Realty Corp., the desire to install a groundbreaking LED video display on the building’s high-profile façade was rooted in more than just aesthetic concerns. In the competitive Times Square display market, the ability to provide advertisers with higher visibility and more creative options for content delivery can be the key to maximizing the value of display space, which can result in a major boost to the property’s bottom line. Sensory Interactive, which specializes in design, technology, and content development and management, was chosen to help SL Green identify various opportunities for maximizing the value of this unique location. They sought to capitalize on those opportunities by creating a system that sets a new standard for large-scale LED video displays. In the planning stages of the project, Sensory Interactive led the development of a display form factor that breaks from the standard practice of tacking LED panels onto a building’s façade, with little regard for the underlying architecture. Instead, the displays at 1515 Broadway are fully integrated with the design of the existing building, functioning as a dynamic part of the building’s façade, rather than as another sign on the outside of the structure. The displays also take advantage of the flexibility afforded by new LED technology to wrap around previously underutilized corners of the building. By limiting visual clutter, this approach also helped alleviate tenants’ concerns of impact on their marketing efforts. The design created a clean look that supports tenants’ visual merchandising goals, rather than overwhelming existing signage and graphics. The structures built to support the displays also add value for existing tenants, serving as covers for building entrances and incorporating new balconies. To support and enhance the displays’ innovative form and structure, Sensory Interactive specified the most advanced technology on the market today. Surface-mounted diodes provide better vertical- and horizontal-viewing angles, better brightness and more contrast, which maximizes their visibility throughout the neighborhood. Sansi, the company that produced the hardware and the world’s second-largest LED manufacturer, gave 1515 Broadway the highest resolution display in the area, while also making it one of the most energy efficient. In addition to setting new standards for display technology, 1515 Broadway is also ushering in a new era for the type of content that advertisers will present in Times Square. The displays’ high resolution, large size and unique aspect ratio (different from standard video formats), are encouraging sponsors and advertisers to produce new and unique materials that take advantage of this very distinctive canvas, as opposed to showing edited versions of advertising produced for television. During the design process, Sensory Interactive also anticipated other capabilities that advertisers might want to test in the future, such as allowing interaction with the displays via mobile devices and motion sensors. The company also made sure that the system’s infrastructure (cabling and server expandability) was designed to accommodate the future use of these technologies. While 1515 Broadway’s high-profile location, distinctive architecture and world-class tenants are the qualities that made this project possible, they also created some daunting challenges that Sensory Interactive had to address during the planning, design and construction process. Chief among these challenges were the engineering and aesthetic issues related to the integration of the displays with the existing building. Mounting the enormous displays to the largely glass façade was a major issue that required careful consideration for obvious safety reasons and business implications. The loss of views into and out of the theater lobby created by the installation led to lengthy negotiations between the landlord and theater, which were ultimately resolved by giving the theater use of additional 48x8-foot display panels that were added by designers to the sides of the primary displays. Sensory Interactive also designed a totally unique system of scaffolding to further protect the images and business operations during construction. The scaffolding had the clean, streamlined appearance of a permanent structure and didn’t interfere with access to the ground-floor retail tenants or block the views from the MTV studios on the upper levels. The Times Square location also drove both the overall timeline for the project and the day-to-day scheduling of the installation. The City of New York required that all scaffolding be removed in time for the Thanksgiving Day Parade. The theater’s matinees and MTV studio’s taping schedule also required work to be halted during certain times of the day. The team had to take special steps to avoid interfering with the operation of the building’s retail tenants. Sensory Interactive addressed these scheduling challenges by carefully choreographing the fabrication, delivery and installation of the display components, minimizing the amount of work that would actually be done on site, and allowing multiple tasks to be completed simultaneously. Sansi manufactured the video panels at their factory in China and then shipped them to a facility located outside of New York City, where North Shore Neon fabricated a specialized frame structure for the displays. The display panels were precisely mounted to the frame structure, minimizing visible seams, and then broken down into pieces, which were small enough for safe transportation to Times Square yet large enough for workers to efficiently lift them into place by crane. The initial response from building tenants, advertisers and the public has confirmed the owner’s belief that creating a truly unique media experience was worth the effort. 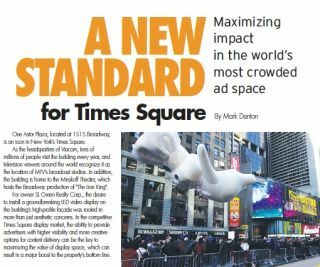 The installation was prominently featured in coverage of the Times Square New Year’s Eve celebration and has already hosted live, interactive advertising events for leading brands, such as Lexus, Nivea and Purina.